Whether you’re looking to build up a range of brushes for easier application in the mornings, or you want to optimise your collection to get the best results, this post from The Beauty Department is essential reading. Full of handy tips and product recommendations, you’ll be smoothing, blending, ‘laying down’ and buffing like a pro in not time. 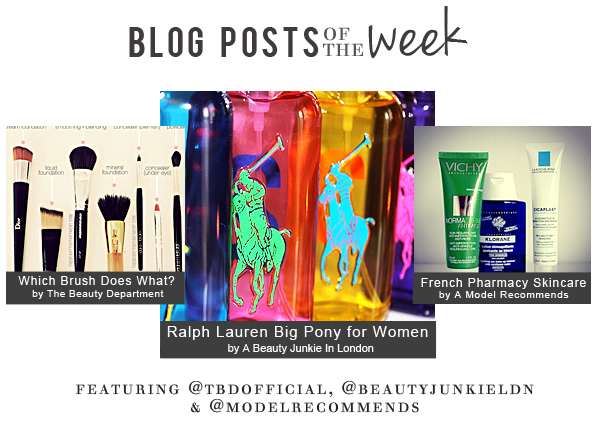 In this post Jen takes us through the new Ralph Lauren Big Pony scents for women, a collection of four distinct fragrance personalities. From the sporty Big Pony 1, to the chic Big Pony 4, there’s something here for everyone. It’s the last week of our French Pharmacy skincare promotion, so it’s almost time to bid au revoir. To inspire you in these final few days, Ruth of A Model Recommends gives us an insight into her favourite products. This entry was posted on Friday, September 28th, 2012 at 1:10 pm and is filed under Blog Posts of the Week, Fragrance, Make-up, Skincare. You can follow any responses to this entry through the RSS 2.0 feed. You can skip to the end and leave a response. Pinging is currently not allowed.